Among jazz musicians, the pianist, composer and producer Meeco alias Michael Maier has been an internationally respected big name for quite some time. On the other hand, he has largely remained unknown to a wide public. This should change very quickly. His fourth album "Souvenirs Of Love" combines irresistible refrains with complex improvisations and is his most personal work at the same time. This "collection of love songs that tell my life" will certainly fire the enthusiasm not only of jazz fans. From intimate jazzy ballad to finely cut R’n’B pearls, elegant modern soul inspired by hip-hop style jazz fit for playing in clubs, and the very varied range of moods of "Souvenirs Of Love" makes this a thrilling CD from the first song to the last. Meeco has mastered the art of soft intermediate tones as no one else has been able to do. Songs such as "Make My Dreams Come True", "Can’t Get You Out Of My Mind" and "Every Day" are fantastic R’n’B with great hit potential. "If Only I Knew" and "Paris At Night" seduce with soulful-jazzy elegance while the impressively melancholic jazz pieces "Words Of Love", "For You" and "Farwell" take up the romantic leitmotif characterizing Meeco's albums "Amargo Mel" (2009), "Perfume e Caricias" (2010) and "Beauty Of The Night" (2012). A circle closes for me with "Souvenirs Of Love" concerning what I did before my first album. I was an integral part of the scene as hip hop and soul producer in Berlin at the end of the 1990s and beginning of 2000. Consequently, I am returning a bit to my beginnings, more in the direction of soul without neglecting jazz as the actual place of my roots in music! With more catchy melodies and refrains, as was the case on my first CD. I wanted to get back to that." Meeco's music is always very personal; he always tells stories from his life. "In his case, I dealt with my experiences of the last two years: the end of a relationship of many years, my move from Paris to Berlin and now the finding of the love of my life. The songs reflect memories, thoughts and feelings about these events." Meeco takes us on a journey. "Imagine that you lived in the same apartment for 20 years and then move. You wound up having a lot of things there. When you are cleaning up, a box falls down. You are surprised, open it and then find old post cards, old love letters, photos, proof sheets, negatives and all kinds of things. All of a sudden, your memories surge up and you are again there. That is the concept of this album." "Letters and pictures, safely ranged in a little box, hidden treasures full of secrets … A journey through time refreshing memories of sweet embrace, devotion, loss and unrequited affection. Souvenirs of love, precious moments of my life. "The great jazz diva Mary Stallings puts all of her life experience into the title song. Mellow and softly melancholic, she recites Meeco's verses with a nature voice, which is a leitmotif for the complete album at the same time. "Souvenirs Of Love" contains a treasure trove of memories of a love as well as moments of happiness and pain. "To express this individual and very emotional music into your respective solo is a fantastic challenge," saxophonist Vincent Herring raved. Meeco consciously leaves his musicians leeway despite the clear guidelines of his compositions. That makes work with him and his recordings so unique. Giants of jazz again meet the stars of the next generation on “Souvenirs Of Love". Guitarist John Scofield is also fascinated: "It is actually an R’n’B album. What a cool idea to engage jazz musicians for R’n’B pieces!" The list of the musicians participating in "Souvenirs Of Love" reads like an overlapping list of who-is-who in jazz and soul. Legends meet young stars and hopeful prospects. These include the bassist Buster Williams, Richard Bona and the young Dezron Douglas from the Cyrus Chestnut Trio, drummers Victor Lewis and Marcus Baylor, member of the Yellowjackets for many years, trumpet players Eddie Henderson and Wallace Roney, saxophonists Vincent Herring, Kirk Whalum and Grammy winner Casey Benjamin, guitarists John Scofield and Lionel Loueke, cellist Jacques Morelenbaum, vibraphonist Stefon Harris, flutist Hubert Laws and pianist/organist Shedrick Mitchell, co-producer of soul singer Maxwell. The soul singer Yahzarah, background singer of Erykah Badu for many years and a distinguished soloist as well as Jean Baylor equally at home in soul and jazz (singer in the band Zhané) are supplemented by the talented newcomer Aaron Marcellus. Conscious-rapper Talib Kweli can be heard on the piece "Times Have Changed" as well as DJ Stylewarz, one of the most well known and influential hip-hop DJs in Germany. Given this impressive selection of top-rate instrumentalists and singers from jazz, soul and R’n’B, you inevitably ask how a largely in the USA and Germany unknown person like Meeco can repeatedly get such illustrious musicians in the studio to have them record his compositions under his direction as producer? The answer lies in his music. Romantic, unique, direct, expressive and classic are the descriptions, which each of his guest musicians say spontaneously when they are asked about Meeco. He remains rather modest on this point: "Recommendations and chance play a great role in how I get the guest musicians whom I want." There was the jazz legend Eddie Henderson at the beginning. "Thanks to his recommendation, the next ones came." A few such as Victor Lewis, Eddie Henderson and Buster Williams have participated from the start, and new musicians repeatedly join in. It is a clique. When you are part of it, you have a network." The sessions with Meeco have long become like a family gathering long ago. They are above all filled with enthusiasm about his compositions and his precision in a studio. The work is also very demanding. For the new CD, the same principle of no practices and no overdubs applies. "We go into the studio and get right at it." 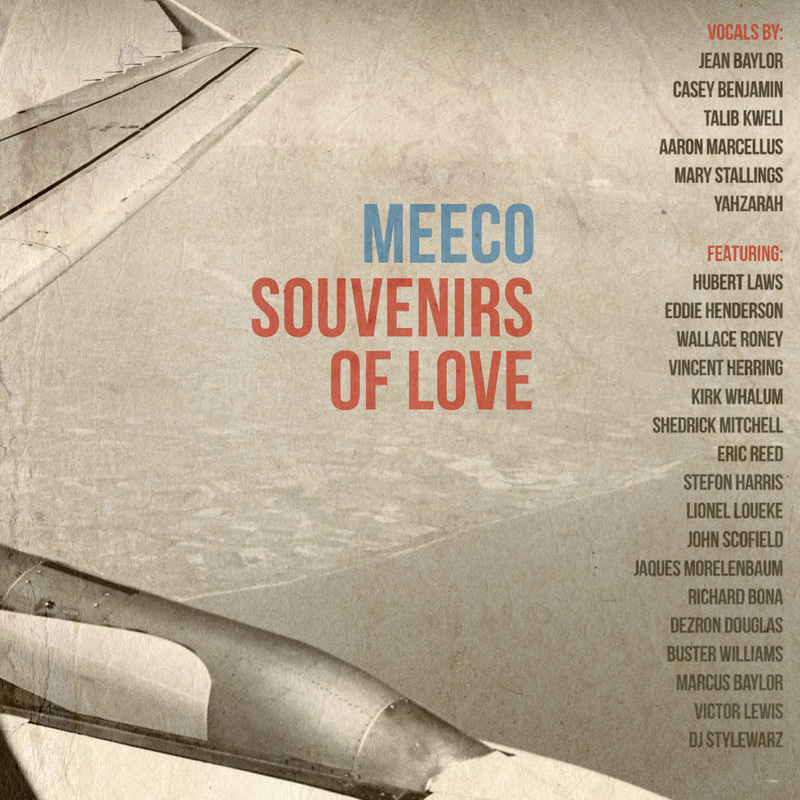 Meeco only needed two sessions in the New York Systems Two Studio to record "Souvenirs Of Love". "The biggest challenge is getting all participants together at one time." The instrumental versions and two remixes round out this album. "The songs have a completely different effect depending on whether are they are sung or instrumental pieces, e.g., "Your Eyes" with vocoder or flute and "Paris At Night" with voice or soprano saxophone. You can moderately get "Times Have Changed" moving as a hip hop or just as a pure jazz number. I considered it important to show that. I also wanted a version, in which the trumpet solo stood out alone as a token of respect for Wallace." The successful German producer Aiko Rohd provided the two remixes for "If Only I Knew" and "Everyday". "Again a chance encounter. We met by chance at the last Echo when he was awarded a prize for Tim Bendzko. He is a jazz fan and got so much out of these songs that I asked myself at the end what I should do with the originals," Meeco laughed. ""His new record "Souvenir of Love" combines irresistable refrains with complex improvisations. A collection of love songs that should not just thrill jazz fans."" "Great atmosphere, good songs, a brilliant all star line up and a superb production. A record like this, that nevers gets boring and is always elegant, touches the musically squaring of a circle. Excellent." "The listener meets a stunning organic ensemble." "Played by jazz musicians, sung by neo-soul and Hip-Hop voices. They let Mecco's music sparkle without smoothen them to much and in the bonus tracke the top-musicians get their chance to shine." Played by jazz musicians, sung by neo-soul and Hip-Hop voices. They let Mecco's music sparkle without smoothen them to much and in the bonus tracke the top-musicians get their chance to shine." "The release is an impressive journey into the depth between jazz and soul." "February Playlist - very mature, very luxurious, very nice to listen to."